Dancing is a lot like blogging. It requires talent, passion and dedication. It is constant work, requiring a solid commitment of body, mind, soul and time. Some will be wildly successful; others will make a solid living from their craft. Still others while capable, even talented, will soldier on, the foot soldiers of the blogosphere, doing what they do without a nickel to show for it, because they love it, because it feeds their spirit. Dancing was wonderful preparation for blogging. As they tell clients at Career Transitions for Dancers, "If you've danced professionally, you can do anything." You are disciplined and a quick learner. Seeking an audience, you are used to putting yourself out there. You know how to sequence and analyze means and procedures. Not only are you accustomed to criticism, both constructive and otherwise, but a part of you thrives on adversity -- on doing the impossible. While rejection hurts, it merely spurs you to keep going. And, most of all, you understand that it's not always the best dancer who wins the prize. Unlike the dance world, which is inherently social, the major physical contact in blogging is with your keyboard. I blog alone, preferably in isolation -- at home, dashing to my laptop while my kids nap, or late at night. One thing that was so gratifying about dancing is that while I may have had to seek out jobs and thereby an audience, I did not have to search for my tribe. My allies were right there beside me in classes, auditions, rehearsals and performances, fellow congregants in the church of movement. How would I find community in blogging, which, at first, was like being set out in the wilderness with some water and trail mix? I began reaching out to a few moms in Mommyblogland. Some were nice, but it was clear we'd be acquaintances only. Others willingly offered wonderful guidance and encouragement, acting as big-sister, as opposed to BFF figures. 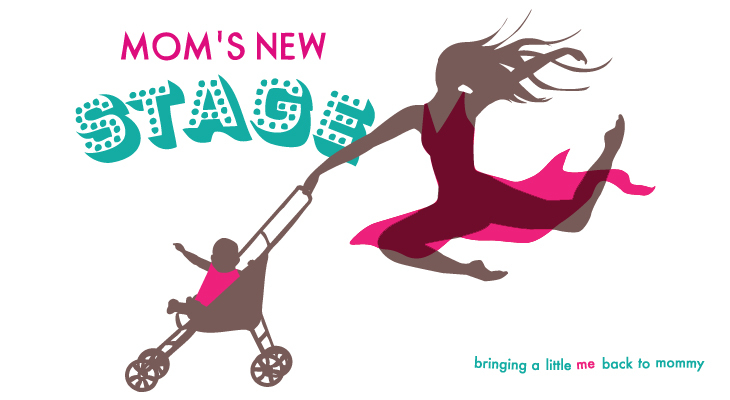 With other bloggy moms, it was like going to an audition and having the "it" dancers give you the once-over punctuated by a dismissive sneer. Those high-schoolesque moments sent me back to Selfdoubtia, with a stopover in Middle Fingestan. But, I kept writing. I kept reaching out to people, knowing that I couldn't be a likeable woman in real life and Pariah Jane on the Internet. And finally I made friends, and began building my tribe. Gina Jacobs Thomas, my fellow bloggerina, at www.totallyfullofit.com is one of my favorite new blogosphere chums. When I saw her profile on www.voiceboks.com (a amazing community and resource for mom-bloggers), I knew I simply had to "meet" her. It turns out that our lives are totally parallel (Ba-dum-bum! Dance humor!). Fellow mother of two, blogger, dancer, dance teacher, ex- New Yorker -- the list goes on. We probably danced circles around each other, not in a dance battle kind of way, but in overlapping orbits within the NYC modern dance scene of the late 90s/early 2000s. On top of that, our husbands even share two names! * Wonder twin powers, activate! Collaboration was the natural outgrowth of our virtual friendship. Gina was my fabulous Mom in the Spotlight post last week. This week I am thrilled to have my first guest post, The Greek Meltdown Dinner, on her blog at http://www.totallyfullofit.com/2011/11/guest-post-greek-meltdown-dinner.html. Please visit her blog, check out my post, and do stay a while - poke around a little. I know you'll find some great reads. Gina's a wonderful writer -- smart, honest, clever and funny. MNS lovers, please show Totally Full of It some love via comments, FB, Twitter or the ultimate of blogger props, the equivalent of having a two year old run to you, jump in your arms and give you a big wet sloppy kiss, a Google follow! *No, they are not the same person. Yes, we are sure.